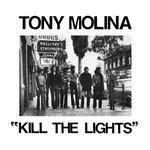 Tony Molina bids farewell to a loved one on Kill the Lights. The Bay Area singer-songwriter does like many of us do when we begin to accept a loveless shift - if you love something, set it free. It's the oldest of axioms, but also an applicable one that holds a universal meaning. Molina, ever the sensitive songwriter, has based most of his work on pithy, yet sufficiently detailed songs that dig into his self-belittling thoughts. There's usually little room for optimism on his self-titled debut, Dissed and Dismissed, and the past four years haven't done much to change his desirable outcomes. But for whatever disappointment comes his way, Molina counters the dejection with performances that are positively histrionic. On Kill the Lights, Molina tones down those blazing guitars and revisits the dawn of the album as a self-contained art form. It has the mellower parts of Rubber Soul in its genes as it does the cornucopia of British folk that adopted more traditional American folk song forms during the sixties. It's also a commanding summation of his output, starting from his days as a member of Ovens, and how that project later informed and gave focus to his self-titled work. Though Molina isn't shy about his influences - even the production assimilates that of a mono recording - he's more focused in finding new ways to make them resonate rather than rely on carbon-copy imitations. A track like Nothing I Can Say sounds like a close study on Mr. Tambourine-era The Byrds, but even Pete Seeger couldn't be bothered to write as intricate a solo on his 12-string as Molina's once it reaches the bridge. To be fair, a majority of Kill the Lights tricks you into believing you've heard another version of it before. The defeated, gospel-inflected Afraid to Go Outside may sound like one of John Lennon's cliched confessionals, but instead of basing the song off of a piano lead and a prominent organ, Molina incorporates a measured staccato on the guitar right we assume he's closing it as a studied, run-of-the-mill ballad. Other times, like on the whispered Before You Go, Molina follows Simon's and Garfunkel's technique of lowering their vocal range to a descending hum while he plays an intricate, finger-picked acoustic melody. It's no less haunting, though, with words that are both pleading and plaintive: "Can I stay with you before you go/ Cause' my house is not a home / We're both living so alone." Even if Molina doesn't describe any specific accounts, he does arch the whole of Kill the Lights with a sad narrative. Leaving them as ambiguous as possible is also very characteristic of the period he evokes, where solid gold-era pop songs could take the meaning of whatever the listener felt as they heard them. But Molina surreptitiously tucks in a little of his manic side - on Give He Take You, he tries to control his temptations about seeing this unnamed person ("But I don't know if I can leave her / Though I know she'd let me down"), while on the melancholic When She Leaves his internal monologue turns almost obsessive ("When she leaves / Where am I to go?"). Even his dry, laconic vocal delivery is an instrument in itself. Comparable to Evan Dando's, who also had a proclivity for dramatic expressions in small packages, his blanket utterances can be as elementary as they are heart-wrenchingly resonant.